In what’s looking more and more like a direct attempt to compete with Marvel’s suggestion that Avengers: Infinity War will feature 68 characters, DC and Warner Bros. just keep adding more and more people to their Justice League movie. In addition to all of the superheroes, we’ll also be getting all of their supporting characters and newbies like J.K. Simmons’ Commissioner Gordon and whoever Willem Dafoe is playing. 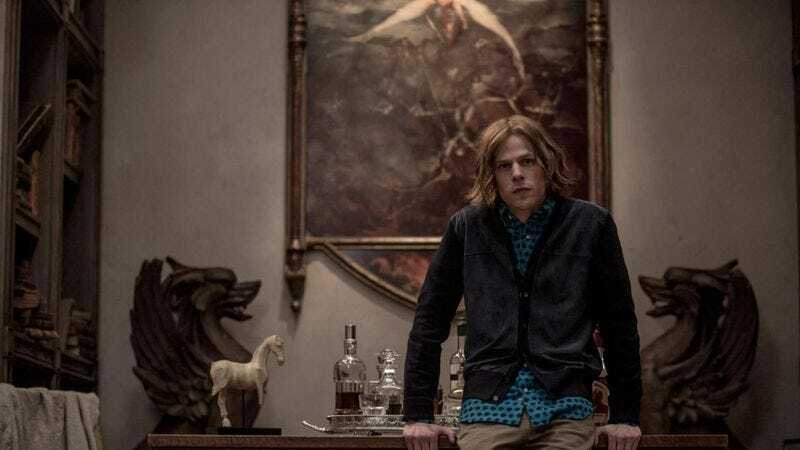 Now, io9 is reporting that Jesse Eisenberg will be reprising his role as Lex Luthor from Batman V Superman: Dawn Of Justice for Justice League, and Connie Nielsen will be there as well, reprising her role as Hippolyta (Wonder Woman’s mother) from the upcoming Wonder Woman movie. That news came from a press kit that featured descriptions and cast lists for all of Warner Bros.’ 2017 movies. According to some theories suggested by io9, Luthor will be continuing his evil schemes from his last appearance (specifically his connection to the planet Apokolips and Justice League villain Steppenwolf) while Hippolyta will probably show up in a flashback establishing the intergalactic history of the Mother Boxes. Flash is Ringo Starr…He annoys everybody, but he doesn’t have any specific beef with anyone…Uncle Fish Curry [Aquaman] is very grumpy. Dad [Batman] gets grumpy too. (He’s had a long life of fighting crime.) ­Wonder Woman is very considerate, so even though she’s annoyed with the Flash, she’s still very compassionate. Justice League will be in theaters next November.